Department of justice refutes claims made by prisoners about rehabilitation programs and food quality. Inside the Burnside prison, taken during a media tour earlier this year. The department of justice is arguing against claims made by prisoners inside the Central Nova Correctional Facility who say they don’t have access to adequate health care, rehabilitative programs or healthy food. Justice spokesperson Sarah Gillis says everything is under control inside the infamous Burnside prison, where inmates have been engaged in a peaceful protest since this past weekend. 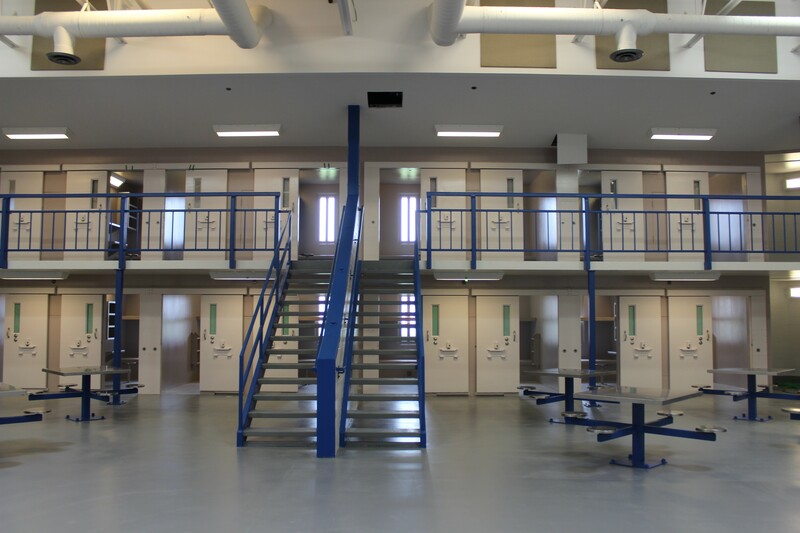 Prisoners inside the Central Nova facility published an open letter earlier this week stating they’ve united in a non-violent protest demanding changes to what they call inadequate and unjust conditions. “The changes we are demanding to our conditions are reasonable, and must happen to support our human rights,” reads the letter, which was published on the Nova Scotia Advocate and Halifax Examiner websites. The inmates make 10 demands, ranging from indoor exercise equipment to use during the winter, better air circulation, personal clothing (including shoes that fit), access to the prison library and more humane health care. Healthier food is also one of the demands, including more nutritious options in the prison canteen and more respect for individual dietary needs. Gillis, however, says those conditions are already being met. “Correctional Services provides healthy food to inmates and respects any cultural dietary needs,” she writes. The spokesperson also fires back against the claims made by inmates that they need access to more substantial rehabilitative programs. A wide range of programs are already available to prisoners through community-based partnerships, Gillis says. They cover areas such as substance abuse, anger management, employment readiness, parenting and education. “Our responsibility is to keep inmates safe and our goal is to help them rehabilitate so that they successfully reintegrate into the community,” she writes to The Coast. Those programs aren’t always effective, however. As detailed in this week’s cover story by Moira Donovan, former convicts who do take part in rehabilitative programs still struggle with discriminatory employment practices once they leave prison. The inmates at Burnside say what rehabilitative programs are available are “little to no” help in getting the work, education and life skills needed to become productive members of society. El Jones, Examiner writer and prison reform advocate, says in an interview with the Advocate that the demands from the Burnside inmates are “all very basic” and that none of the claims about prison conditions are contentious. Jones suggests those on the outside can help show their support by calling the justice department or their MLA, writing letters and bringing attention to the cause through social media posts. An information meeting on ways to help the inmates will be held Thursday, August 23, at 6pm at the Glitter Bean Cafe on Spring Garden Road.